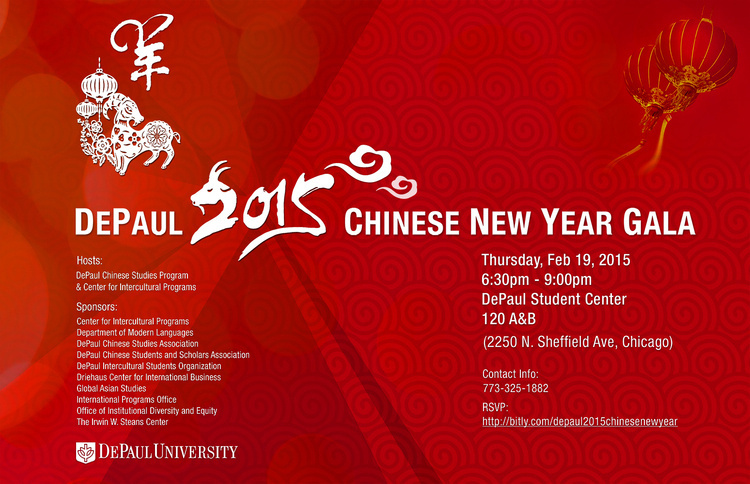 This is DePaul University’s annual celebration of Chinese lunar new year. Come out to enjoy authentic lunar new year dinner and exciting cultural performances by DePaul students and professional performers. It is also a great opportunity to network with new and old friends with interest in China and other Asian countries and regions. All DePaul students, alumni, faculty, and staff, as well as friends outside the DePaul community are welcome to attend. Free and open to the public. DePaul guests, please bring your DePaul ID to check in. Please let our check-in staff know if you were born in a year of the goat (1991, 1979, 1967, 1955…). you have a great chance to receive a year of the goat gift!